Field trials for Setters and Pointers have been run in Manitoba since 1886 when the Manitoba Field Trial Club held its inaugural Derby and All-Age Stakes near Morris, about 50 miles south of Winnipeg. 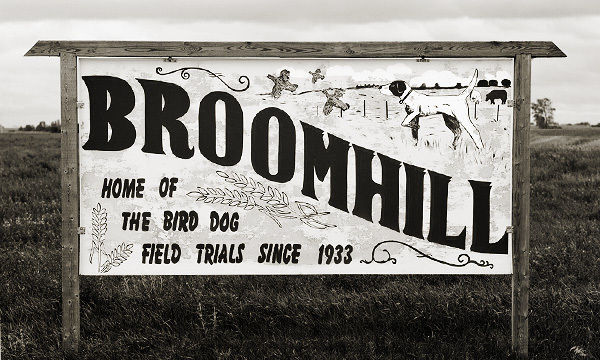 Field trials are still held in Manitoba today, but further west, just outside of Broomhill, a small hamlet that most people in Manitoba have never heard of. But among field trialers, Broomhill is almost as well-known as Grand Junction Tennessee. When I interviewed Hall of Fame trainer and handler Colvin Davis last fall during the Manitoba Championship Trial, I asked him about Broomhill. Here is what he had to say. Awesome! I love this stuff, keep it coming. A lot of nice photos.